The steps described on this page explain how to quickly create a simple iOS application that makes requests to the YouTube Data API. This sample shows how to retrieve data about the GoogleDevelopers YouTube channel. The code also includes comments that explain how to modify the query to retrieve data about the current user's YouTube channel. Note: The application does not conform with Apple's iOS Human Interface Guidelines. It is intended only to illustrate the basic concepts and steps needed to begin working with the YouTube Data API. Use this wizard to create a new app or select an existing one. Enter an app name in the App name field, and enter "com.example.QuickstartApp" into the iOS Bundle ID field. Click the Continue button to proceed to choose and configure services. Click the Google Sign-In icon. (It might already be selected.) Then click the Enable Google Sign-in button. Click the Continue button to proceed to generate configuration files. Click the Download GoogleService-Info.plist button to download the configuration file. Take note of where you saved it. Click the Enable the YouTube Data API button. Use the dropdown menu to select the project that has the same name as the app name that you specified in step 2. Then click the Continue button. The credentials page shows API keys and OAuth 2.0 client IDs created for your project. The OAuth 2.0 client IDs section lists two IDs, one for a web application and one for iOS. Click on the link for the iOS client. 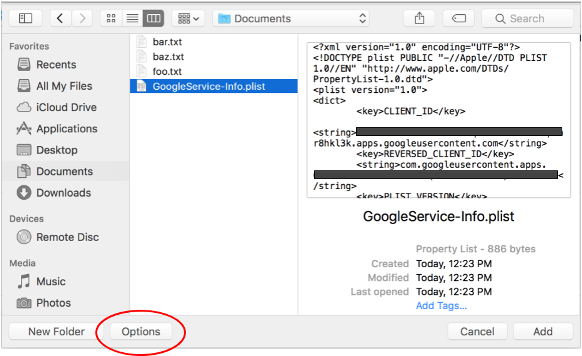 Open the GoogleService-Info.plist file that you downloaded in step f. Compare the CLIENT_ID and REVERSED_CLIENT_ID values in the file with the Client ID and iOS URL scheme shown for the iOS OAuth 2.0 client. If they do not match, update the values in the file to those shown for the iOS client. Note: All of the examples are based on the name com.example.QuickstartApp. If you named your app something other than that, like com.example.QuickstartYTApp, change the string QuickstartApp to match your app name. Click File > New > Project, select the iOS > Application > Single View Application template, and click Next. Set the Product Name to "QuickstartApp", Organization Identifier to "com.example", and Language to Objective-C. Below the organization identifer, you should see a generated Bundle Identifier that matches the iOS Bundle ID (com.example.QuickstartApp) that you entered in step 1.b. Close the project by clicking File > Close Project. Open a Terminal window and navigate to the directory that contains the QuickstartApp.xcodeproj file you just created. 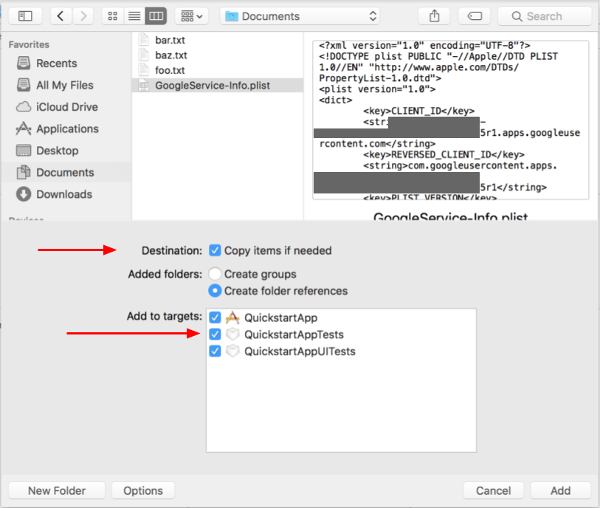 In the XCode Project Navigator select the project node "QuickstartApp". Then click the menu item File > Add files to "QuickstartApp". Locate the GoogleService-Info.plist file downloaded earlier and select it. Click the Options button. Check the Copy items if needed checkbox. Check all targets listed in the Add to targets section. Select the Info tab, and expand the URL Types section. Click the + button, and add a URL scheme for your reversed client ID. To find this value, open the GoogleService-Info.plist configuration file that you selected in step 2.f. Look for the REVERSED_CLIENT_ID key. Copy the value of that key, and paste it into the URL Schemes box on the configuration page. Leave the other fields blank. Click Product > Clean Build Folder (while holding the option key). // Add the sign-in button. // Create a UITextView to display output. // Initialize the service object. // YouTube channel. Display the channel title, description, and view count. // line (query.identifier ...) and uncomment the next line (query.mine ...). Switch to the QuickstartApp scheme by clicking Product > Scheme > QuickstartApp and run the sample (Cmd+R) using the device simulator or a configured device. The first time you run the sample, it will prompt you to log in to your Google account and authorize access. Bummer. Thanks for letting us know and we'll work to fix this quickstart. Authorization information is stored in your Keychain, so subsequent executions will not prompt for authorization.